Archaeologists investigate oyster shell middens (piles of shucked oyster shells) to learn more about America’s earliest human inhabitants. Pottery and other artifacts found in middens provide evidence that Paleo Indians inhabited the coastal areas of what is now the Southeastern United States thousands of years before the first Europeans arrived. 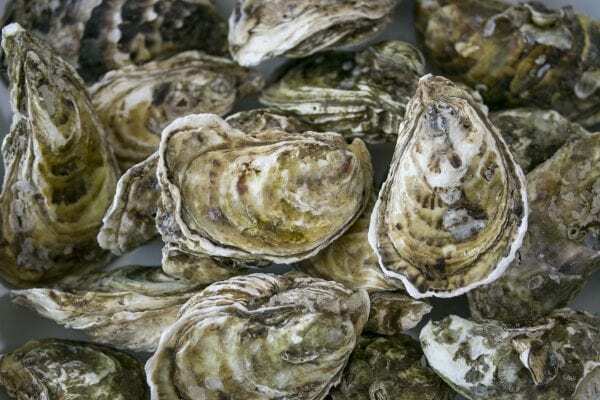 Early European settlers in America also used the abundance of oysters they found along the coastlines and in the bays of the 13 colonies to provide themselves with an easily harvested dietary component. Oysters played other important roles in the cultures of both groups. Oyster shells were used by the Paleo Indians for tools, jewelry, and currency (wampum), and shell middens were sometimes used as burial sites. Seventeenth century European settlers used oyster shells as construction materials for buildings and roads. Today in Alabama, oysters are harvested by the old-fashioned method of tonging. This is carried out from small boats by using tongs (rakes on the ends of long wooden poles) to gather and hold the oysters until they are lifted on board. Much of the oyster tonging in Alabama is conducted on public oyster reefs, but increasing numbers of oysters are cultured in waters adjacent to privately owned land. Alabama law provides owners of property fronting on the waters of the state the right to grow oysters in front of their land to a distance of 600 yards from shore. This is referred to as the owners’ riparian oyster right. Some owners lease the right to culture oysters on their riparian oyster bottoms to other individuals. Riparian oyster rights allow the commercial oyster industry additional production from a more managed form of aquaculture. Oysters, along with mussels and scallops, are among the invertebrates called pelecypods (hatchet foot) that are included in the phylum Mollusca (clams, snails, squids, and octopods). There are more than 100 species of oysters throughout the world. The waters of the Gulf of Mexico contain several species. Of these, only the Eastern oyster (Crassostrea virginica) is commercially important. Adult oysters release eggs and sperm into the water. After fertilization, the fertilized eggs proceed through several swimming larval stages. Ultimately, the larvae become too heavy to remain suspended in the water and sink to the bottom. Those that settle on a suitable substrate (clean, hard bottom) secrete a fluid that cements them permanently to the bottom. Oysters eat by filtering food from the surrounding water through their gills. Under ideal conditions, an oyster can pump 5 gallons of water an hour through its filtering apparatus. 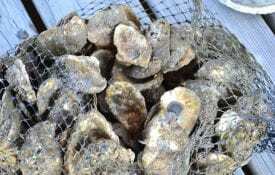 Alabama oysters reach harvestable size (3 inches) in 24 to 30 months. Because oysters cannot move, they are at the mercy of the surrounding environment. Along with their food (diatoms and algae), tides and currents can bring silt or sand to smother them, predators to feed on them, or microorganisms to pass upwards through the food chain. For this reason, state and federal health authorities pay close attention to molluscan shellfish. Like all other varieties of seafood, when oysters are landed at the dock or offered for import, they may be inspected by numerous authorities. Seafood inspection is not the continuous “carcass-by-carcass” inspection associated with red meat and poultry. Seafood is routinely inspected with a frequency determined by past experience or potential for a particular commodity to cause illness. State and county health authorities inspect all processing plants, grocery stores, and restaurants where seafood is processed, handled, or sold. The United States Food and Drug Administration (FDA) inspects seafood processing plants to ensure compliance with federal standards for sanitation, Good Manufacturing Practices, branding, and labeling. The FDA also checks seafood products for pesticides and other contaminants, and assures the wholesomeness of imported seafood and products shipped across state lines. The FDA pays particularly close attention to raw, minimally processed, and ready-to-eat seafood. Because oysters, clams, and mussels are often eaten raw, the FDA’s National Shellfish Sanitation Program (NSSP) carefully monitors them from their growing waters through processing, and ultimately to retail outlets. The NSSP Manual of Operations is routinely revised by the Interstate Shellfish Sanitation Conference (ISSC), a voluntary group composed of members from FDA, state health regulatory agencies, and industry. ISSC committees and task forces generate revisions and resolutions that are forwarded to FDA for approval. Once the revisions and resolutions are approved, FDA adds them to the NSSP Manual of Operations. To sell oysters in interstate commerce, states must have industry and health agency practices that are consistent with the NSSP Manual of Operations. State health agencies comply by routinely monitoring, classifying, and opening and closing shellfish growing and harvesting waters in the interest of consumer protection. In turn, processors: attach tags to sacks or boxes of shellstock oysters (live oysters in the shell) to note oyster harvest date and location; properly label containers; and maintain strict temperature controls to minimize bacterial growth. Like most seafood, oysters provide sound nutrition. A 3-1/2 ounce (100 gram) uncooked serving contains 7.9 grams of protein, 3.5 grams of carbohydrate, 2 grams of total fat, 57 milligrams of cholesterol, and 75 calories. Oysters are moderately low in sodium. A 3-1/2 ounce serving also provides 100 percent of the recommended daily allowance (RDA) for Vitamin B12 and zinc, plus 65 percent of the RDA for niacin, and about 35 percent of the RDA for iron. Oysters are frequently marketed live in the shell. They are also sold fresh or frozen, as canned meats, or frozen and breaded. Live oysters are sold by the dozen, by the bushel bag, or in bushel-fraction boxes. Six live oysters per person is a normal portion, although many people will eat more. Shucked oyster meats are graded and sold according to size, usually in 8-ounce and 12-ounce cups, or in pint, quart, or gallon containers. Allow 1/3 to 1/2 pint of shucked oyster meats per serving. If you purchase oysters in the shell, make sure that they are alive. Live oysters hold their shells tightly closed. Tap any oysters with slightly opened or “gaped” shells. Live oysters will respond by closing their shells tightly. Oysters that do not respond are dead and should be discarded. When purchasing freshly shucked oyster meats, choose oysters that are plump and have a natural creamy color and clear liquid. 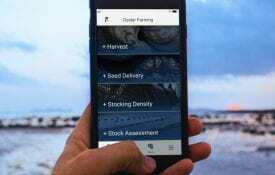 Raw molluscan shellfish should only be purchased from reputable dealers. All shellstock oysters are required to have an accompanying tag that allows the buyer to trace the oysters back to their point of harvest. Shucked oyster meats must be in sealed containers displaying the processor’s permit number. Retail-sized containers (1/2 gallon or smaller) of shucked oyster meats must have a “sell by” date stamped on them. Shucked oyster meat containers larger than 1/2 gallon must display the “date shucked”, and cannot be offered for sale beyond 14 days after that date. In-store “dipping” of oyster meats from larger containers into smaller cups is not legal in Alabama. Thoroughly wash and scrub all mud and debris from the shells. This is best done with a garden hose and scrub brush. To shuck whole oysters, use gloves and an oyster knife. An oyster knife has a heavy wedge-shaped blade and handle, often made in one piece. It is designed to withstand the pressure required to open oysters. Never use a sharp knife. A platter of oysters ready to eat. Insert the oyster knife into the crevice between the shells at the hinge; twist the knife while pushing it firmly into the opening to sever the hinge. Once the hinge is broken, before pulling the shell apart, slide the knife along the inside of the top shell to cut the adductor muscle away from the top shell. Remove the top shell and slip the knife under the body of the oyster, being careful not to mutilate it, and cut the adductor muscle away from the bottom shell. Remove any remaining shell particles that may be attached to the oyster. Most oysters, except the very largest, can be opened by this method. Store oysters to be eaten fresh in the refrigerator using either of two methods. Shellstock (unshucked) oysters can be stored without ice in ventilated containers in the refrigerator at 35 to 40 degrees F, and should remain alive for 7 to 10 days. 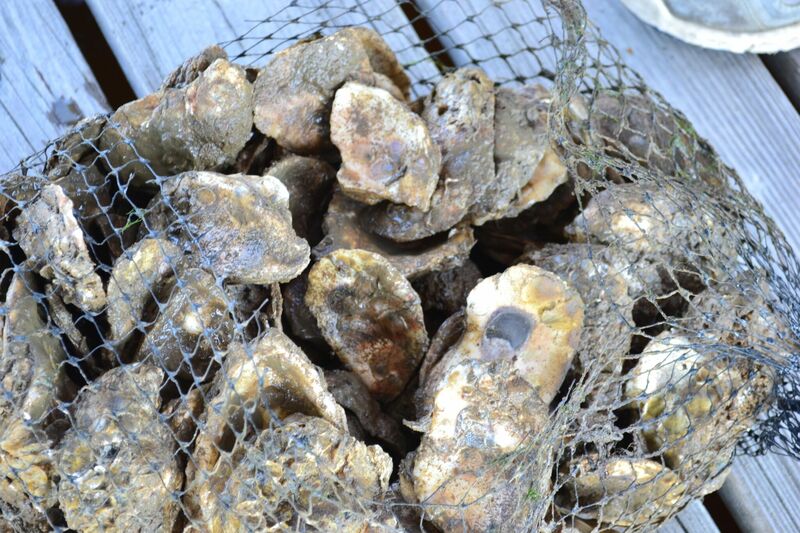 Freshly shucked oyster meats can be placed in sanitized 1 cup or 1 pint containers or plastic freezer bags. These containers or bags should be packed in ice and placed in the refrigerator. Oysters stored by this method will keep for 7 to 10 days. Oysters can be frozen, but they will be of lower quality than fresh oysters. The simplest method is to freeze oysters in the shell. Place the oysters in a plastic bag, press out excess air, seal the bag, and freeze. The shell and juices provide an excellent natural container for the oyster meat. Shucked oyster meats can be frozen also. They will maintain a better flavor if frozen in their own natural juices which is called liquor. Place shucked oyster meats in sanitized plastic containers or freezer bags. Leave 1/2 inch of headspace above oyster meats in plastic containers. Press freezer bags flat against oyster meats to expel excess air. Seal and freeze as quickly as possible. Oysters frozen by either of these two methods will keep for 2 or 3 months. Do not thaw and refreeze oysters. Thaw overnight in the refrigerator only. Thawing under running water washes away the flavor. It is best to use previously frozen oyster meats in preparations like oyster dressing, chowders, or stews where appearance is not so important. Any protein food eaten raw poses a greater risk of causing illness than does the same protein food cooked. However, commercially available oysters (and other molluscan shellfish) harvested from certified waters, packed under sanitary conditions in inspected facilities, and properly refrigerated pose little risk of causing disease when consumed raw by most healthy individuals. Along the Gulf Coast, we hear a great deal about seafood-related illnesses resulting from the bacteria, Vibrio vulnificus. 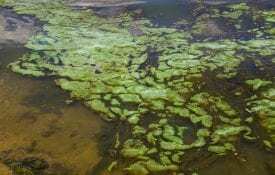 This free-living microbe occurs naturally in temperate brackish estuarine areas throughout the world. The numbers of Vibrio vulnificus in coastal waters increase during the warmer months. Thus, most cases of Vibriosis occur during late summer and early fall. One way Vibriosis can be contracted is by a puncture wound through which the Vibrio bacteria gain entry to the body. 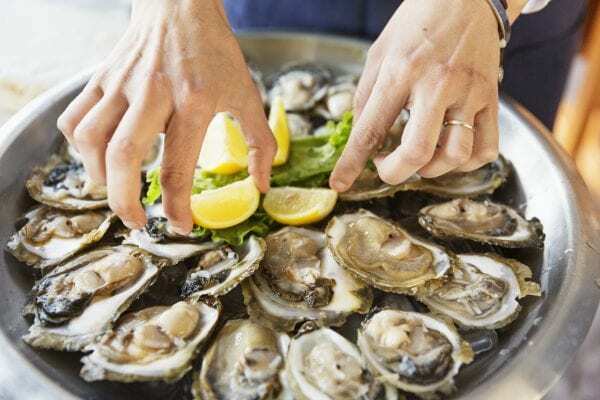 The disease can also be acquired by eating raw, undercooked, or minimally processed seafood, including oysters and other molluscan shellfish. It can range in severity from a condition similar to (and commonly mistaken for) gastroenteritis, with associated nausea, vomiting, and diarrhea, to a life-threatening primary septicemia. Since harmful microbes are killed by heat, high-risk individuals should enjoy oysters and other molluscan shellfish cooked. Persons who catch or harvest their own oysters should be certain that the waters are approved for harvest. County and state health authorities can provide advice about area openings and closings. Avoid cross-contamination between raw and cooked shellfish. Always sanitize raw product handling surfaces before placing cooked or ready-to-eat foods of any kind on the surface. Refrigerate or freeze leftover, cooked oyster preparations promptly. Use refrigerated, cooked oysters within 2 days. Remember–all raw foods, including oysters, contain bacteria. Handle oysters as you would any perishable food. Keep oysters cold, handle oyster meats with clean hands on sanitized surfaces, and use older products first. Purchase oysters only from reputable, properly licensed or permitted outlets. This material was previously published by the Southern Regional Aquaculture Center as S.R.A.C. Publication No. 434. This publication is also partly funded by the Mississippi-Alabama Sea Grant Consortium and NOAA, Office of Sea Grant under Grant No. NA66RG0206. MASGP-97-008.